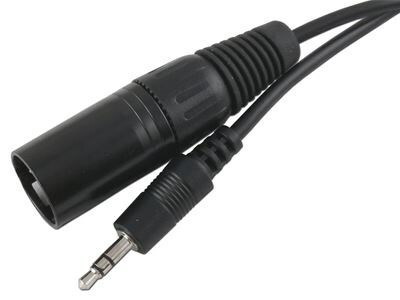 6FT Audio Cable - Male XLR to 3.5mm Stereo Plug. These Microphone Cables are great for many different applications like making a speech in school or for adding a little karaoke to your home stereo. These cables are Black PVC jacketed cable and shielded. Great quality. Left and Right audio signals are shorted together to render a mono output. XLR side is not permanently molded and allows the flexibility to modify this configuration.